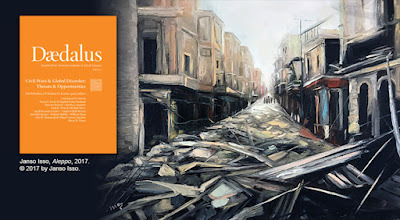 "The Fall 2017 issue of Dædalus, "Civil Wars & Global Disorder: Threats & Opportunities," is the first publication of the American Academy project. The second volume, "Ending Civil Wars: Constraints & Possibilities," will be published in January 2018. The project will host a series of discussions in the United States and around the world, including in places directly impacted by civil war, with government leaders, heads of nongovernmental organizations, practitioners, academics, and journalists, among others, that will inform a subsequent publication incorporating policy recommendations for national and international engagement..."
“Civil Wars & Global Disorder: Threats and Opportunities,” the Fall 2017 issue of Daedalus, the journal of the American Academy of Arts and Sciences, explores the causative factors and influences of contemporary civil wars, as well as the international community’s regime for responding to them. Guest edited by Karl W. Eikenberry and Stephen D. Krasner. The Fall 2017 issue of Dædalus, "Civil Wars & Global Disorder: Threats & Opportunities," is the first publication of the American Academy project. The second volume, "Ending Civil Wars: Constraints & Possibilities," will be published in January 2018. The project will host a series of discussions in the United States and around the world, including in places directly impacted by civil war, with government leaders, heads of nongovernmental organizations, practitioners, academics, and journalists, among others, that will inform a subsequent publication incorporating policy recommendations for national and international engagement. In their introduction to this issue, guest editors Karl W. Eikenberry (Stanford University; Lieutenant General, U.S. Army, retired; former U.S. Ambassador to Afghanistan; Member of the American Academy) and Stephen D. Krasner (Stanford University; Member of the American Academy) draw on their personal experiences in government and military service, which were deeply influenced by Al Qaeda's attack on the United States, to recognize the profound difficulties of effectively "treating" civil wars as a third party. Yet as they state, "the complexity of the problem, however, should not lead policy-makers to ignore and dismiss the potential threats." Instead, they propose that we grapple with the scope and impact of intrastate warfare, factor in the effects of globalization and the current shifting of global power, recognize the roles of national elites, and recalibrate goals for stability and security. In the twelve essays in this issue, the authors explore causative factors of civil war, the connection of intrastate strife and transnational terrorism, the limited successes and failed ambitions of intervening powers in the recent past, and the many direct and indirect consequences associated with weak states and civil wars, including the dangers posed by pandemics, mass migrations of people, and great-power proxy warfare. The volume offers specific examples from Central Asia, the Middle East, South America, and sub-Saharan Africa.